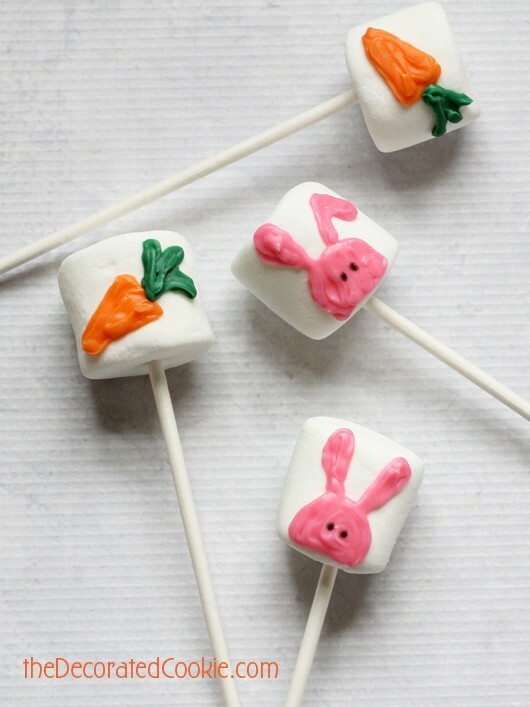 Simple Easter marshmallow idea: Bunny and carrot Easter marshmallow pops. Lately I’m all about the candy melts on marshmallows thing. I haven’t given up my edible writers, but creating the art with candy melts is almost as easy and tastes even better. 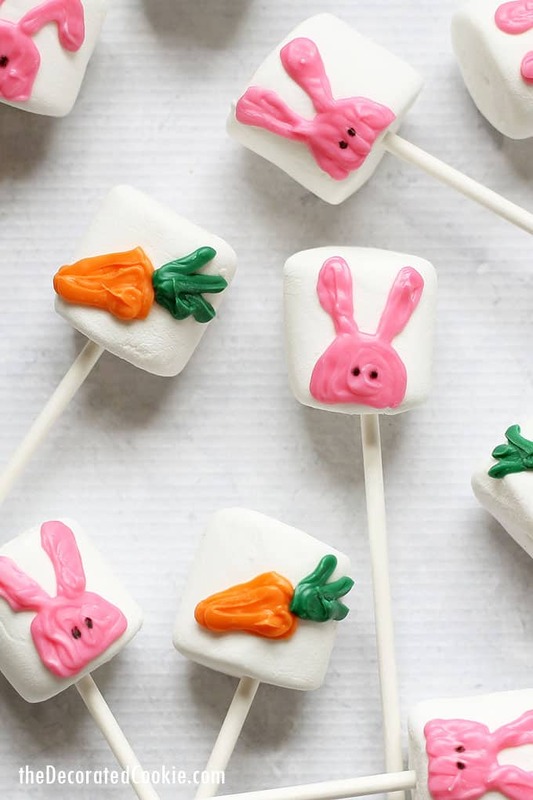 These cute bunny and carrot Easter marshmallow pops are a great last-minute treat to give or serve for Easter. 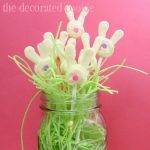 Wrap them in little cello bags with ribbon, or prop them on a Styrofoam block covered with Easter grass. Don’t worry about being too precise with your piping. Candy melts can be inconsistent with the runny-ness, so they aren’t as forgiving as icing. 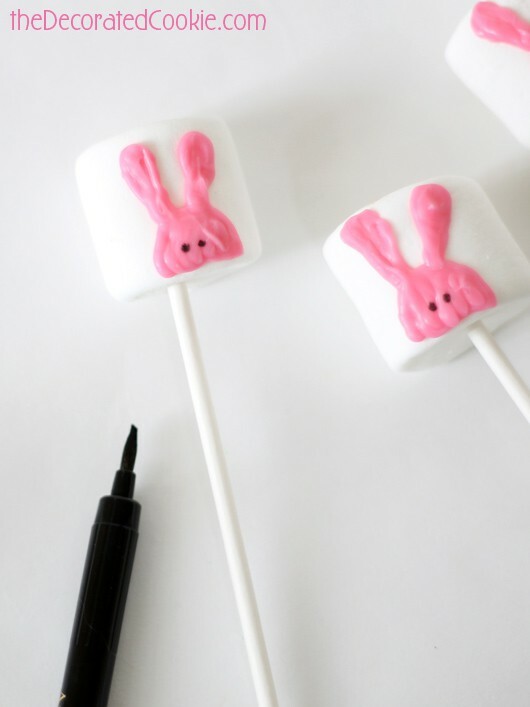 Especially as those pesky marshmallows can move while you’re piping on them. Just remember, they are going to get eaten. No one will care if they aren’t perfect. And those that do don’t get marshmallow pops. 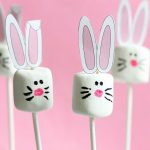 *Find the lollipop sticks, decorating bags and candy melts at the craft store. You should also find the writer there, though shown is an Americolor Gourmet Writer, found online. 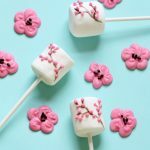 Find tips on finding edible writers HERE. And find tips on finding supplies HERE. 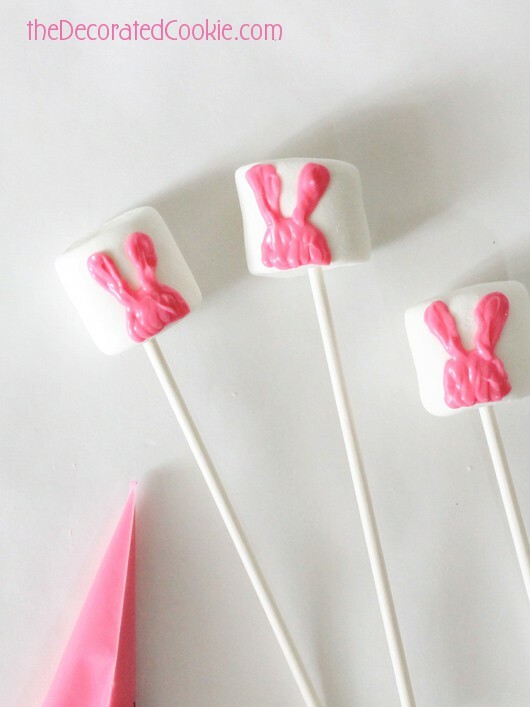 Skewer marshmallows with lollipop sticks and line up on a tray lined with wax or parchment paper. 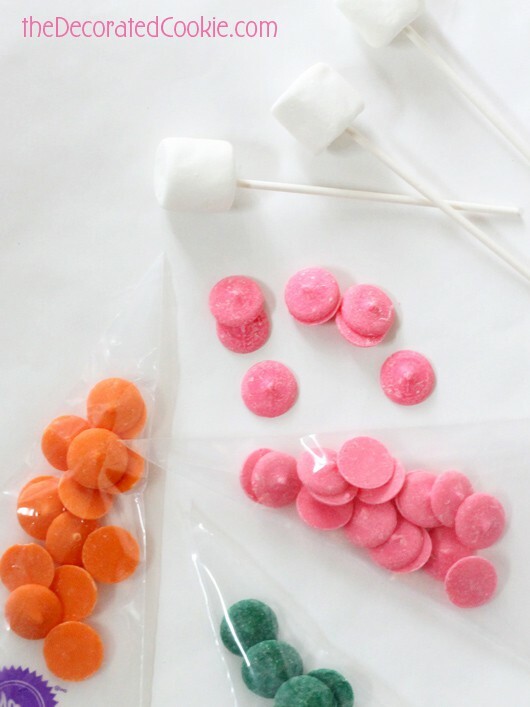 Fill the disposable decorating bags with pink, orange and green candy melts. A little goes a long way, so I only used 1/4 cup in each bag. Melt and work with only one color at a time, since the melts dry quickly. 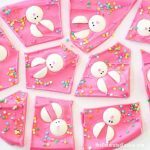 To make the bunnies, place the pink bag on a paper towel in the microwave and nuke for 90 seconds at 70 percent power, massage the bag, and continue at 15 second intervals until fully melted. Snip 1/4-inch from the tip. 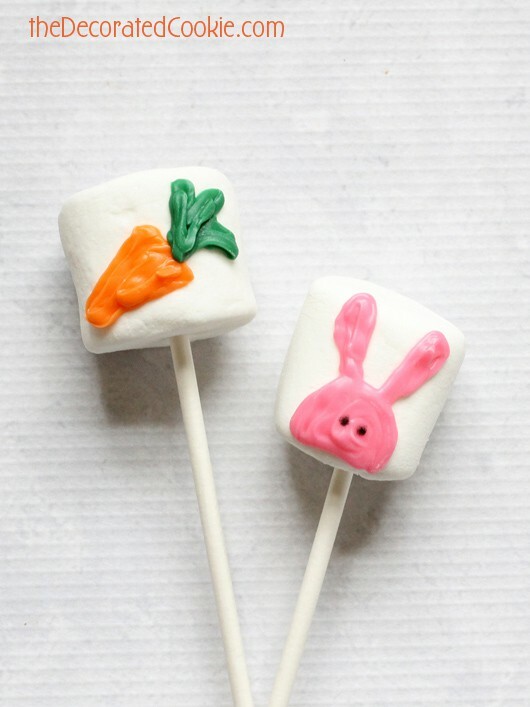 Pipe the bunny head and ears on the marshamallows and let dry at least 30 minutes. When the candy is dry, draw two dots for eyes. 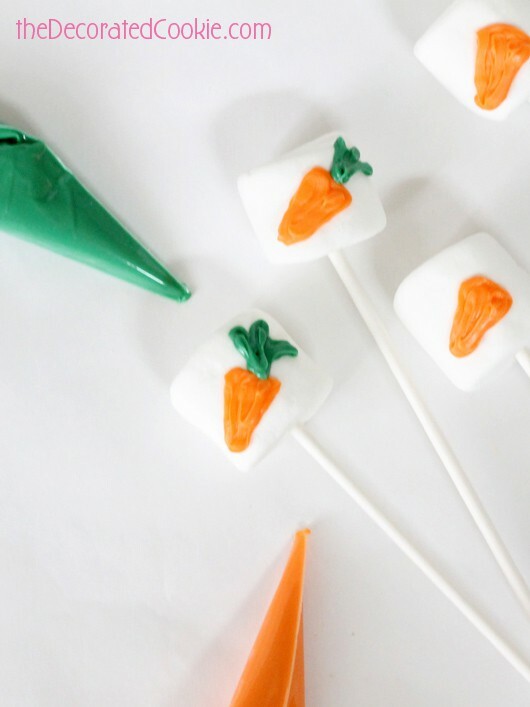 To make the carrots, melt the orange candy and pipe the carrot shape. Melt the green candy and pipe the stems. Let dry at least 30 minutes. Super cute + Super simple = Yay!